I can't take credit for the photo, it is from Google images but important to this piece; willy wagtails are very quick little birds and difficult to photograph by an amateur. This piece was inspired by a conversation with a young friend who had a near death experience within a year of our eldest son's accident. Their lives were running in parallel and both accidents happened at about the same time in their lives. When waking from a coma, one of the first questions he asked of his mother was why he had been fortunate to live and our son did not; he struggled with this for some time before we were able to visit him a year after our sons accident. I like to think that we were able to help him in some way to come to terms with his question. He has now moved back to our home state and we caught up with him last weekend, nearly three years since his accident. He still struggles a little but we talked at length about both our sons death and his own accident. He told us that he has seen a willy wagtail when he has been at his lowest and feels that it is his much loved grandmother telling him she is watching over him. We feel the same way about wanderer butterflies; I often see a single one when I am thinking of my son. Our connection to our loved ones that get us through the bumpy bits of life. 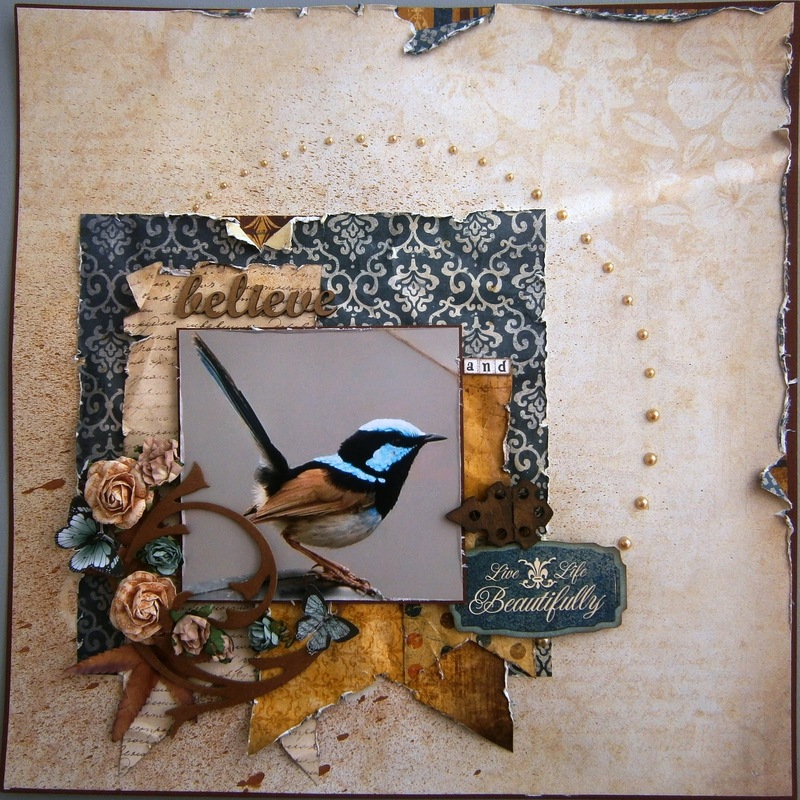 I have made a card the same as this layout to send to our young friend; Believe and Live Life Beautifully. I am leaving my comment through teary eyes. Your story is both sad and beautiful and thank you for sharing it. The colours you have used to high light the pretty little bird are perfect, as are all the details. A beautiful card, one that I'm sure will be cherished by your young friend. Thanks for playing along at Lets Get Shabby. Oh my, what an eloquent post, so beautifully explained and felt. How wonderful we can put those feelings into such a creative process that can mean so much. I LOVE little Fairy Wrens, they are my favourite little birds.. and yes they are sooooo hard to photograph because they are so quick. your a strong person !! when you smsed me this paged i straight away knew it was one of my favourites and i didnt know the story behind it. this page has a lot of love into it with words to live by. Gorgeous page Susan. Thanks for sharing the story behind it and playing with us at Shabby. What a hearfelt story! beautiful work too, the colours are so perfectly combined. Thanks for playing along at LGS!